"In a grand gesture of reclamation and remembrance, Mr. Halberstam has brought the war back home." David Halberstam's magisterial and thrilling The Best and the Brightest was the defining book about the Vietnam conflict. More than three decades later, Halberstam used his unrivaled research and formidable journalistic skills to shed light on another pivotal moment in our history: the Korean War. 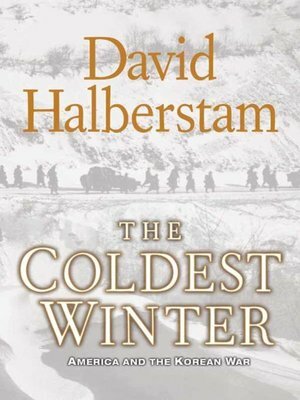 Halberstam considered The Coldest Winter his most accomplished work, the culmination of forty-five years of writing about America's postwar foreign policy. Halberstam gives us a masterful narrative of the political decisions and miscalculations on both sides. He charts the disastrous path that led to the massive entry of Chinese forces near the Yalu River and that caught Douglas MacArthur and his soldiers by surprise. He provides astonishingly vivid and nuanced portraits of all the major figures-Eisenhower, Truman, Acheson, Kim, and Mao, and Generals MacArthur, Almond, and Ridgway. At the same time, Halberstam provides us with his trademark highly evocative narrative journalism, chronicling the crucial battles with reportage of the highest order. As ever, Halberstam was concerned with the extraordinary courage and resolve of people asked to bear an extraordinary burden. The Coldest Winter is contemporary history in its most literary and luminescent form, providing crucial perspective on every war America has been involved in since. It is a book that Halberstam first decided to write more than thirty years ago and that took him nearly ten years to complete. It stands as a lasting testament to one of the greatest journalists and historians of our time, and to the fighting men whose heroism it chronicles.